Hudson's Trials and Triumphs : Mercies Are New Every Morning! We got a good report from the NICU team in that Hudson's levels still are ok and his catheter surgery is scheduled for Wednesday (3/23/16) at 1:00 PM. We felt at peace signing the surgery consent forms and are hopeful that dialysis will work for Hudson.The surgeon is confident in the surgery it's the after affects that is the worry. Potential risks of the catheter include infection, perforation of another organ, or it leaks. It sounded like dialysis will be good for Hudson's brain and will help reduce the over all swelling in his body. It will be up to the surgeon if it would be a good idea for Hudson to start dialysis the same day as the surgery or to wait until the next day. 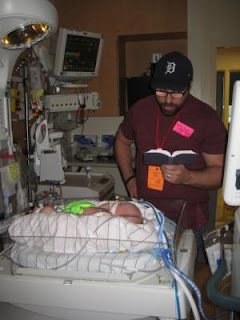 Now our prayer is that Hudson would respond well to dialysis as I am hopeful that all other pieces will start falling into place like reduction of swelling in his body, him to fully breath on his own so the breathing tube can come out, and for him to be introduced to eating breastmilk. Today was special because mommy got to help bathe Hudson and change his diaper. 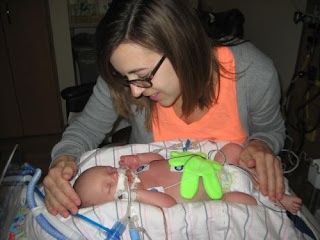 Hudson didn't open his eyes for us today but he did grasp a lot to our fingers. Since daddy held Hudson yesterday mommy got to hold him today. We got home in time to enjoy a wonderful family dinner of LOTS of leftovers and were able to take the girls to a short Easter egg hunt at grandma's work. We have been SO blessed by all the prayers, our church and AHG family bringing us meals or helping watch our girls, our neighbors, friends and my mom. So many people have reached out to help us and we are overwhelmed and so appreciative of everyone. Words can't even describe the feeling but we certainly feel all of your love and encouragement. Phillipians 4:6-7 "Be anxious for nothing, but in everything by prayer and supplication, with thanksgiving, let your requests be made known to God; 7 and the peace of God, which surpasses all understanding, will guard your hearts and minds through Christ Jesus." Psalm 59:16 "But I will sing of your strength; I will sing aloud of your steadfast love in the morning. For you have been to me a fortress and a refuge in the day of my distress."